Importing horses from Russia isn’t easy. 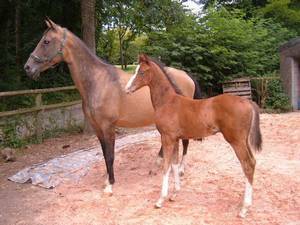 Lara’s sale was agreed in summer 1999, but it was Christmas 2001 before she arrived at Kyzyl Akhal-Tekes, Herr and Frau Blatt from Biberach, Germany, having kindly found a place for her on their own shipment of horses from Stavropol. 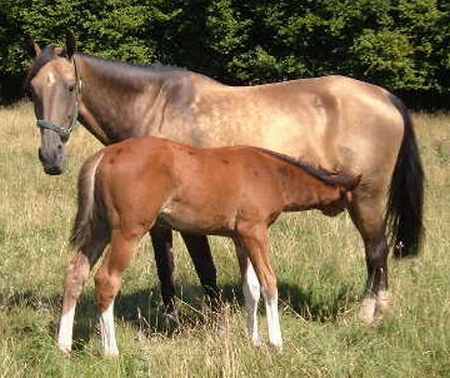 She has bred three foals: KYZYL KAZAN [Zak] (2003) by Atamekan, KYZYL DOUBLE or QUITS [Sam] (2005) by Welton Double Cracker, XANADU [Xan] (2006) by Atamekan, and DJARGALAN [Django] (2008) by Atamekan (frozen AI). 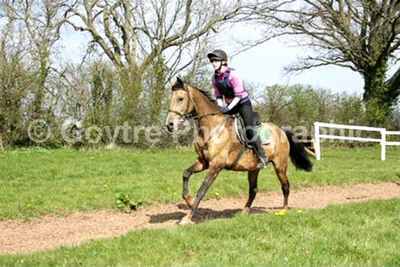 In 2004, between foals, she came into work for a few months and did some pleasure rides with Claire Shepherd. Soon in foal again, she returned to being a mum, which is her preferred occupation. Just as well, for following an accident as a yearling she is blind in one eye and has damaged nerves in her lower jaw, so it would be hard for her to become a competition horse. Her name gives rise to an extraordinary coincidence. 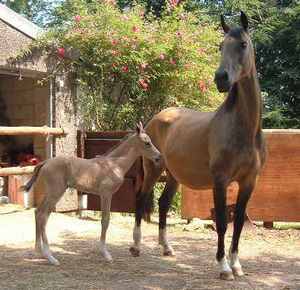 Ainur, the first foal bred here, was named for a little girl in Turkmenistan, the daughter of Atamekan’s former owner. It was later discovered that the name means “Moonlight”in Turkmen. “Gulara” (who was named at birth, long before coming here) is also a common Turkmen name for a girl. “Gul” = “Flower” and “Ara” = “Centre”. However, Claire discovered that “Gulara” also possesses a meaning in Australian Aborigine. The meaning?